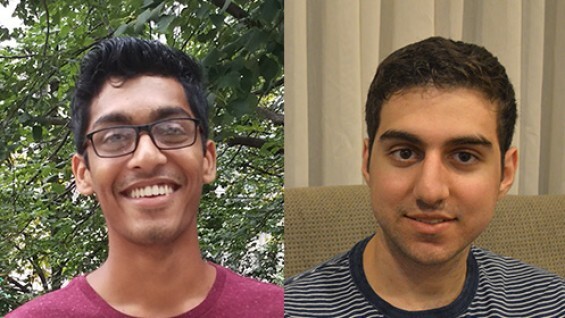 This summer, Nikhil Iyengar and Robert Faddoul, both rising sophomores at the time, participated in the New York City Regional Innovation Node (NYCRIN) I-Corps, a program started by the National Science Foundation (NSF) in 2012 that teaches researchers how to articulate and test a set of hypotheses about what it would take to convert their technologies into marketable products. Nikhil and Robert took part in the program’s 5-week “bootcamp” that teaches the current best practices of start-up companies. They were the youngest members of the class and were some of the youngest participants in the program's history. “The goal is to learn the skills needed to assess whether or not your idea could be commercially viable. Robert and Nikhil learned how to test the validity of an idea with real world market feedback,” said Christina Pellicane, manager of NYCRIN—one of seven regional offices of the NSF’s I-Corps program—and an adjunct instructor at The Cooper Union. Using a “flipped” classroom model, Prof. Lima required students to watch lectures and read from their text before class meetings. Class time was largely spent on group presentations given by students who had to explain their ever-evolving strategies for testing their business ideas and incorporating concepts from the lectures. The design of EID 103 was one of the reasons that Forbes magazine named Cooper Union the #1 Most Entrepreneurial College of 2015. In class, students received immediate guidance from the teaching team comprised of the instructors, Lima and Pellicane, a teaching assistant Tom Chan ME’17, and eight mentors, experts from the worlds of business and technology. One mentor was assigned to each group. Nikhil and Robert’s team worked with Joel Ndreu, an electrical engineer who was Chief Operating Officer of STV Inc. Initially the group expressed interest in creating an energy-saving device for people to control power usage of their appliances remotely, estimating that the device could save users approximately 20% on their electricity bills. To understand potential interest in the product, they conducted interviews with industry experts and company executives. “We found people don’t care about saving 20%. For many of them the electric bill is part of their rent. So we said ‘Okay, let’s pivot,’” said Nikhil, using entrepreneur-speak for changing direction. At that point, Ndreu suggested they research Con Edison’s Demand Response policy. The group learned that when strain on the power grid reaches a maximum, the company contacts institutions to request they shut down power in exchange for payment. Perhaps, the team thought, a similar benefit could be earned by individuals. They began thinking about how their device could be used to support a demand-response program directed at consumers. They could shut down their appliances remotely upon Con Edison’s request and earn a payment from the power company. Nikhil said that they learned to ask analytic questions. “Instead of asking, ‘Would you use a certain project,' we asked, ‘How would you use it’ or ‘Why would you use it,’” he said. After all their research, the two made an informed decision not to continue with the project. “There were many factors that made our proposed business not viable. A major factor was that the lifetime value to the customer-acquisition cost ratio was too low,” Robert said, referring to the expenses incurred in trying to gain new customers over time.